As a local locksmith company in Trenton, we get a lot of calls from customers requesting their locks and deadbolts on their homes be replaced. It’s common for homeowners to think that if they’ve lost keys or given out one too many, they need to replace the entire lock on their front and rear doors. Fortunately, homeowners can rekey their locks instead of replace them. At Firstline Locksmith, we make sure you get exactly what you need when it comes to your home security. Want to schedule a locksmith professional? Give us a call today! In this post, we’ll discuss the difference between lock replacement and lock rekeying. We’ll also share the best approach to decide which decision fits your home security needs. When a locksmith completes a lock rekey, he or she replaces the spring and pins in the lock to respond to a new key. As long as the lock is of the same manufacturer specs and designs, the rekey is possible. In most cases, a lock rekey is completed to regain key control. When a home switches hands between one homeowner to the next, the keys used to access the home are typically accounted for. It’s important that you at least rekey the locks so any keys loaned out by the previous homeowner cannot be used to access your new home. Typically, property managers will rekey the locks on houses they sell if they’ve had a tenant in them prior to the sale. Housing developments that use a single builder typically have home locks that allow a master key to gain access. This means that the builder, and whomever the builder distributes a master of the copy key to, has access to all the buildings on the lot. If you’ve moved into a home on a large, single-builder development, you’ll want to get your locks rekeyed. When a lock is damaged beyond repair, it’s necessary to replace it to ensure the security of your home. Your local locksmith in Trenton can assist you in deciding which lock will fit your security needs. What if you simply want to change the look of your locks? This is completely possible as well. If you’re a homeowner who wants to change the aesthetics of your locks, find a few locks you like and then give Firstline Locksmith a call. Unfortunately, burglaries happen. At Firstline, we believe your locks are the first line of defense when it comes to home security. In the event that you experience a home burglary, you’ll not only want to replace the locks, but you’ll also want to upgrade them to a higher security rating. Call Your Local Locksmith in Trenton Today! 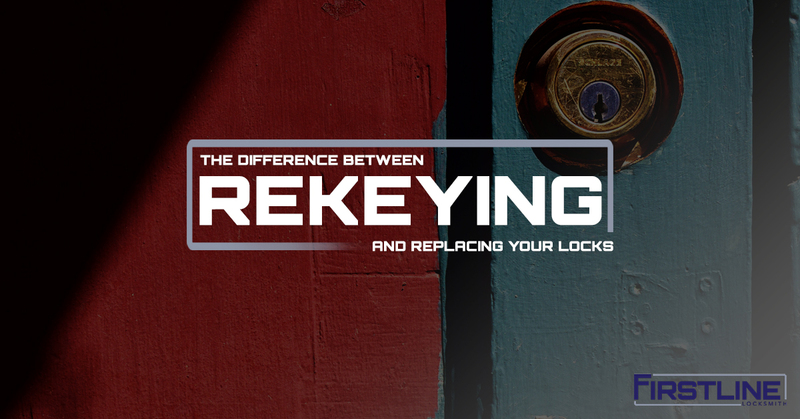 You can save money and time when you rekey your locks instead of replacing them entirely. Consider why you want to replace your locks and then give Firstline Locksmith a call. We’ve been serving Trenton, New Jersey, and the northeastern region for more than 25 years. We’re here to help you make the best lock decision possible.